SUPPLIES: Stain: I am a fan of Minwax Jacobean stain. It’s what we used in my office on the desk and on our fireplace mantle. Plus, I still had some left over from previous projects, so I didn’t even have to buy a quart! I did, however, purchase standard staining supplies – gloves, rags, drop cloth, and clear coat (we used matte water-based polyurethane to avoid it being super shiny). 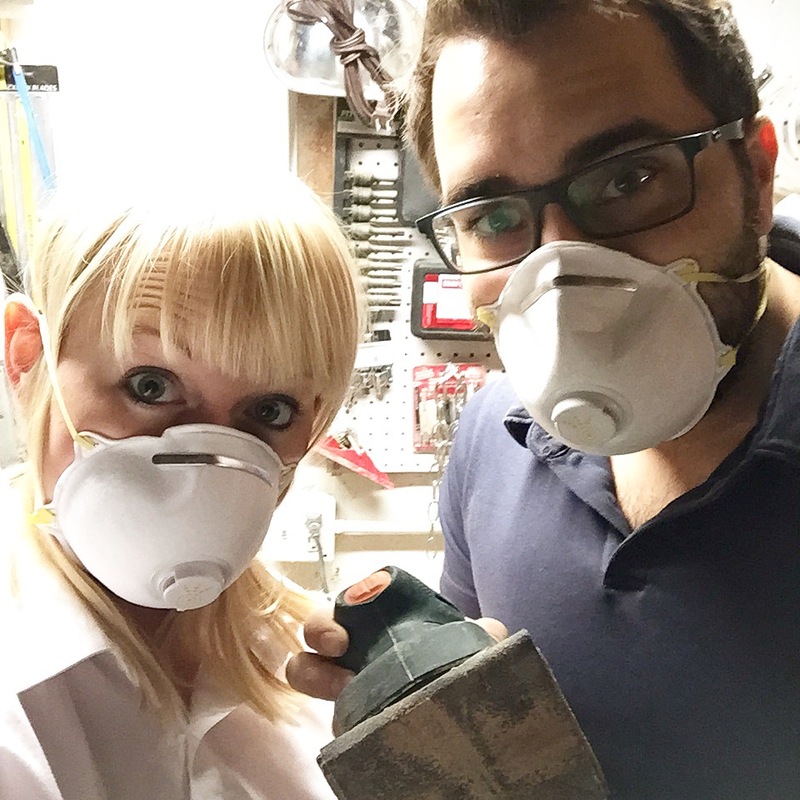 Masks: there’s a lot of dust during the sanding process and fumes during the staining process, so wearing a mask is great for protecting brain cells… unless you don’t care about those – then by all means… take a deep breath! Fabric: I bought gray suede fabric at JoAnn Fabrics. It was originally $20/yard on clearance for $8/yard – score! I needed 6 yards total for the front and back of both the headboard and the footboard. Quilt batting: In order to make the headboard and footboard nice and cushy, I put quilt batting behind the fabric. This also helped cover up the square insets so they didn’t show through. 8lb quilt batting worked perfectly. I bought it by the yard at JoAnn Fabrics for around $4.00/yard – I purchased 6 yards to match the amount of fabric I bought. Rope Trim: I finished off the edges of my fabric with a rope trim that just happened to match my fabric beautifully. Because I was going for a more subtle/tonal look, I loved the idea of it matching my fabric, but a contrasting trim could also be really fun as a pop of color in the right space. This trim was about $1.50/yard and I bought 8 yards. See close up below of the finished product installed. Staple Gun/Staples: I used 3/16” staples and went through A LOT! More than an entire box! That fabric isn’t going anywhere! – Bonus – I already had the staples, and the staple gun, so I didn’t have to buy this for this project. PROCESS: We started by sanding off the old finish. 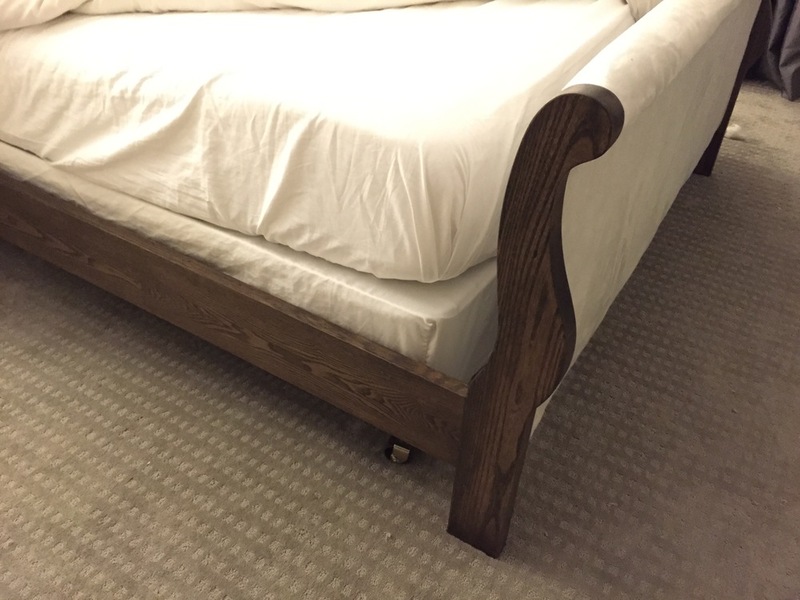 This bed frame is veneered which I was very nervous about refinishing. However, as long as you do not sand completely through the veneer, you will be totally fine! We used 50 grit sandpaper to sand the old finish off and you can see what we were left with – a nice, clean slate! Be gone with you 90’s orange wood! While Justin was sanding away at the work bench, I laid out a 9’x12’ drop cloth and started staining. I just brushed on the stain and let it sit until it was the darkness I preferred. For this project, it was about 8 minutes, but it depends on what type of wood. When we stained the solid pine for our fireplace, it was more like 20 minutes. In order to test to see if it’s done, I just took a little rag and wiped off the stain to see if it was dark enough. If it wasn’t, I simply reapplied stain in that spot and kept waiting. Once it’s dark enough, wipe of the stain, step back, and admire the beauty of newly stained wood! Once all the pieces were sanded and stained, we let them sit for about 2 days to cure. Then, Justin lightly sanded it with 80 grit sandpaper and applied 2 coats of matte polyurethane clear coat. This helps seal the stain and protect it in the future. I wasn’t able to find an oil-based matte sheen sealer, so I had to use water-based. Sometimes water-based sealers can raise the grain as they soak into the wood more than oil based. If the wood feels rough after sealing it, just use light sandpaper and gently sand it. Again – we let the finish on the bed rest…. Get it? Rest? Okay, bad joke. Lucky for us, we were on vacation while it was curing, so it had plenty of time to harden while we were gone. When we got back from vacation, it was ready to go! I covered the front and back in quilt batting by using the staple gun to attach it to the wood. Then, I stapled on the fabric. The shape of this bed was perfect for upholstering. 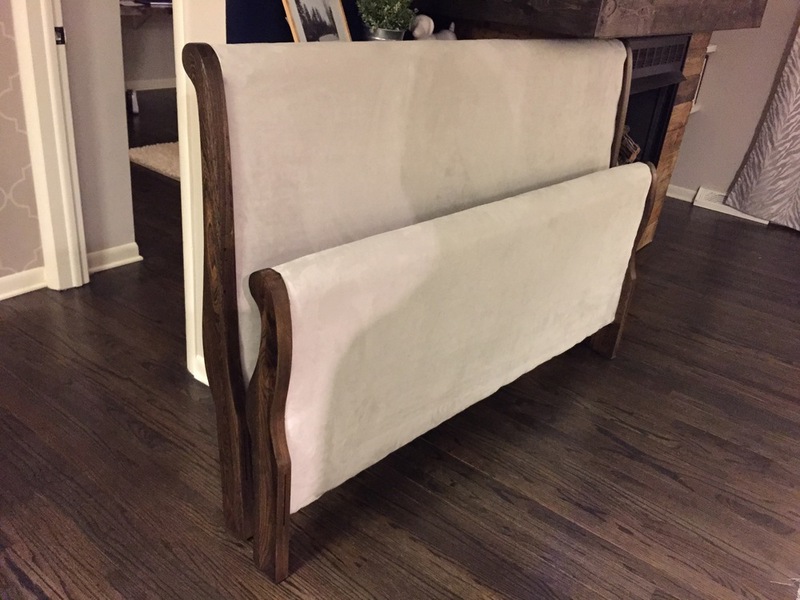 The end caps on the headboard and footboard offered a perfect place to die the fabric into so it didn’t require any sewing or fancy upholstering skills. On the edges, I would fold under the fabric so that there were not any rough edges of fabric that would fray. I worked left to right stapling the left side once, pulling the other side taught and stapling that side once, and then moving back to the left again. It helped ensure that my fabric stayed nice and straight. Once it was covered in fabric, I glued on the rope trim using fabric glue. This was definitely the easiest step. I absolutely love how it turned out! I should warn that this was not a QUICK project! 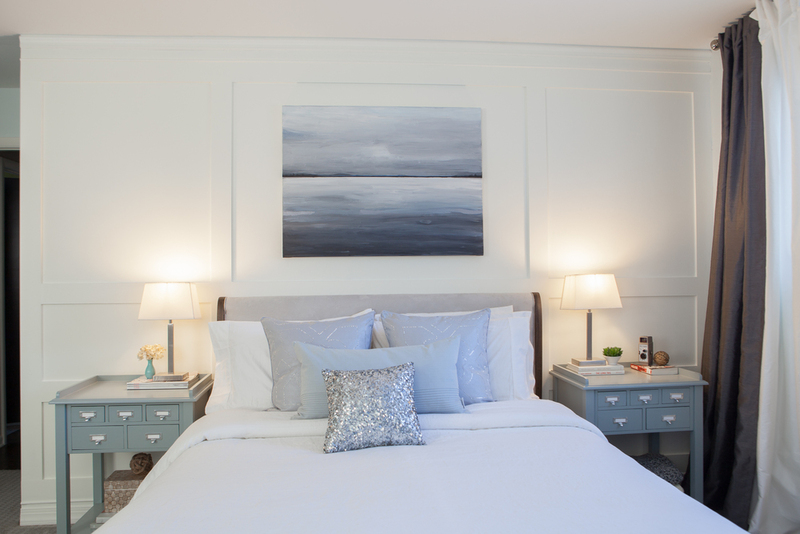 Together, we had about 15 hours of labor into this bed… consider it a labor of love – appropriate for a master bedroom, don’t you think?